With nominations closed for the ‘Top 50’ Professional and Career Women Awards 2018, organised by Women in Management (WIM) and IFC, a member of the World Bank Group; it is now up to the esteemed judging panel tapped for the eighth edition of this prestigious awards program to ensure that only the best candidates from civil society and the private and public sectors are highlighted for their contributions toward taking Sri Lankan women to the world. Having started the judging process on 10 July, the panel of judges are faced with the daunting task of sifting through over 382 nominations received in 2018. The panel for the ‘Top 50’ Professional and Career Women Awards 2018 consists of Dr. Rohantha Athukorala, Country Director, Turner Investment L.P; Amena Arif, IFC Country Manager for Sri Lanka and Maldives; Kasturi Chellaraja Wilson, Managing Director, Hemas Pharmaceutical Ltd./Surgical and Diagnostics Ltd.; Roshanie Jayasundera-Moraes, Executive Vice President/Chief Marketing Officer – Property Group, John Keells Holdings; Kumar Samarasinghe, Director – Marketing, Singer Sri Lanka; Rajitha Jayasuriya, Group Director – Legal, MAS Holdings; Nisthar Cassim, Editor – DailyFT; Gowri Rajan, Executive Director/CMO, Sun Match Company; and Dilruskhi Dias Wickramasinghe PC, Additional Solicitor General, Attorney General’s Department of Sri Lanka. “We see more women playing the pivotal positions in organisations but they continue to remain in the back stage and do not like to get highlighted for success. In my view it’s a cultural issue that will fade away with the entrenched competition we see in the market place. The ‘Top 50’ Professional and Career Women awards helps create awareness for remarkable Sri Lankan women and their exemplary values, ideas and deeds, to which we can all aspire," says Head of the 2018 Panel of Judges Dr. Rohantha Athukorala. Rohantha is the only person in Sri Lanka to be Chairman of Sri Lanka’s Export Development Board and Sri Lanka Tourism the top two revenue generators for the country. He was also Chairman of the 30 billion-rupee Government entity Lanka Sathosa. His roles in the public sector follow an outstanding 21 career with top global multinationals Unilever, Reckitt Benckiser, DiverseyLever and the United Nations. He is an Alumni of Harvard University Executive Education whilst also having a double degree in marketing from the University of Sri Jayewardenepura and Chartered Institute of Marketing (CIM) UK. Rohantha is Paul Harris Fellow and Exceptional Performance awarded from Rotary. “Each year, the process to identify who should take home an award gets harder – simply because each year we see more and more talented women being nominated. The Top 50 Professional and Career Women awards provide a platform to highlight the achievements of Sri Lankan women across many sectors and brings to the fore more women role models to inspire the next generation. On a national level, it can also encourage more women to enter the workforce, leading to a more balanced, inclusive workforce,” says 2018 Panel Judge Amena Arif. Amena joined the IFC Country Management team for Sri Lanka and Maldives in early 2016. In this role, she oversees IFC’s investment and advisory operations across both countries, and led the diversification of IFC’s portfolio in Sri Lanka. Prior to this, she was based at IFC’s office in Pakistan working in Middle East and North Africa region. Her role there was spread across both investment and advisory services provided by IFC for private sector financial market players. Amena has worked in challenging post conflict and fragile markets across Asia and the Middle East. She joined IFC in 2012 after a diverse career path within the banking industry in general and Citibank, in particular. “Applicants for the awards have become very competitive in recent years. This year especially there were many well-accomplished women seen by the judges who have made it to the top, albeit under the radar, who have come forward to take part,” says 2018 Panel Judge Roshanie Jayasundera-Moraes. Roshanie currently serves as Executive Vice President, and Chief Marketing Officer of the Property Sector, of John Keells Holdings PLC. She has been with the Group since 1991. During her tenure, she has also overseen the Airlines and Supermarkets business for the Group. A diploma holder in marketing from CIM UK, Roshanie has also earned MBA from the Post-graduate Institute of Management (PIM) of the University of Sri Jayawardenepura, Sri Lanka. “The high quality of past winners, as well as the recent awards in Canada, has led to the bar for the awards being set very high, so recognised on August 7 will prove to be even more challenging for whoever entered this year,” says 2018 Panel Judge Kasturi Chellaraja Wilson. Kasturi is the Managing Director, Hemas Pharmaceutical Ltd./Surgical and Diagnostics Ltd. and Managing Director of Hemas Logistics and Maritime cluster. Having started at Hemas in 2002 as the Finance Director of Hemtours (Presently, Diethelm Travel), she was appointed as the Head of Shared Services for the Group in 2005 and subsequently as the Chief Process Officer in 2007. She is a Fellow of the Chartered Institute of Management Accountants (CIMA) UK and Alumni of Havard Business School. She is a Non-executive Director of Morrisons PLC and Capital Alliance Ltd and a member of the sub-committee on Economic, Fiscal and Policy Planning of the Ceylon Chamber of Commerce. “The current crop of candidates vying for the August 7 awards has shown they are up to any challenge, even when going up against women professionals from Canada and other countries globally. They are undoubtedly taking Sri Lankan women to the world,” says 2018 Panel Judge Gowri Rajan. A top business professional from Kandy, Gowri is the Director/CMO of the Sun Match Company, which counts market leaders Soorya matches and Sun Aqua bottled drinking in its portfolio of products. She was also the first female Sri Lankan Rotary Governor as well as being selected by Rotary International as one of the top 150 ‘Service Above Self’ awardees. Gowri has participated in many Global Rotary projects including being the Global President’s representative to Australia, Taiwan and India, an honour bestowed by Rotary only a select few outstanding leaders globally. “We as judges are mindful to look at a candidate’s achievements from many different viewpoints. Not only should she excel in her career, she also has to be able to inspire others. And we give extra weight to those going beyond their own companies to inspire women in their community and industry as well,” says 2018 Panel Judge Kumar Samarasinghe. Having served on many WIM Award judging panels in the past, Kumar is the current Director – Marketing at Singer (Sri Lanka) PLC. As of February 2011, he is also a member of the Company’s Board. Kumar holds a Diploma in Business Administration, a Diploma in Marketing and an MBA from University of London. “There were many nominations put forward by WIM members, since this year as well there were a number of silent achievers. WIM members and even judges took the initiative in 2018 to highlight deserving women often overlooked despite doing so much for the country. 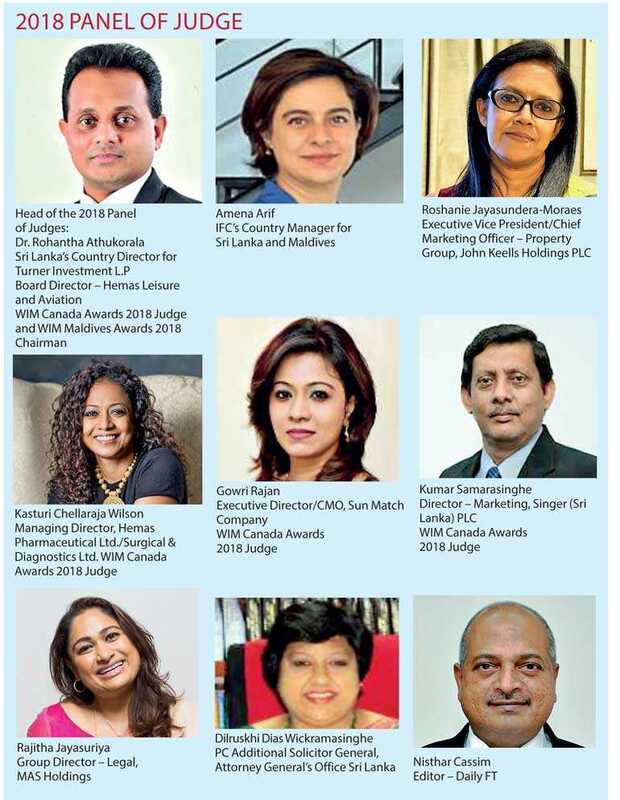 We are grateful to WIM members for giving their time to nominate these remarkable, yet unsung, women professionals as well,” says 2018 Panel Judge Rajitha Jayasuriya. Joining apparel manufacturing giant MAS in 2004, and currently serving as its Group Director – Legal, Rajitha set up its legal team over a decade ago. Since then, she has been in the thick of it in terms of business transformation, with her responsibilities centring on corporate law, intellectual property and corporate governance. Recently, the Group has also become active in cross border acquisitions around intangible assets and startups adjacent to its core areas of specialisation. MAS’s dynamism and diversity has for a long time stretched the legal unit’s responsibility beyond reviewing contracts. It has to keep pace, adapt and anticipate new demands from the transformation of the group’s global operations. Rajitha leads an all-female team of lawyers who deal with the entirety of the group’s legal needs. “The judging panel was very concerned with the quality of women taking part, going so far as to personally check references and ask for additional clarifications from nominees. The process may not have been easy, because judges had to frequently justify the choices they made, but it was a worthwhile process since the award winners will go on to inspire not only other women working for them but also women in related industries and across Sri Lanka,” says Panel Judge Dilruskhi Dias Wickramasinghe PC. As an officer of the Attorney General’s Department, Dilrukshi is a legal advisor to the Government of Sri Lanka, with wide experience in both civil and criminal law, litigation, drafting of pleadings, arbitration, IT law, telecommunication law, company law, IP law, banking law, international trade law, dispute resolution, project finance, medical negligence, customs law, commercial contracts. She has a wide experience administering two government institutions. Her past assignments have included serving as a High Court Judge for the Fiji Islands judiciary during 2010 and 2012, and Chief Legal Officer for the Sri Lanka Air Force prior to that. She is also a lecturer in contract law and examiner, with extensive expertise in anti corruption law and investigative methods, and the implementation of the UNCAC. Her passion is anti-corruption work, where she has excelled at preventing corruption and creating awareness of the need of anti-corruption efforts. “The increasing number of newcomers nominated, across all sectors, is a very encouraging development witnessed by the judges, which suggests that future prospects for women in Sri Lanka are definitely on the rise. Awards programs such as the ‘Top 50’ Professional and Career Women Awards 2018 have been instrumental in shifting this paradigm by creating awareness about remarkable women and making their achievements known, to encourage others to step up and step forward,” says Panel Judge Nisthar Cassim. Nisthar is a Senior Journalist and the Editor of the Daily FT, a national English-language daily newspaper of the Wijeya Newspaper Group focusing on business, finance and economic issues that he founded in 2009. He was previously the Editor of the Daily Mirror and The Bottom Line and has been a journalist since 1988. A product of Carey College, Nisthar was the recipient of the first Business Journalist of the Year award by The Editors’ Guild of Sri Lanka and, in 2011, was honoured with the Global Commerce Excellence Medal at the Global Commerce Excellence Awards.